Everyone knows that Sydney house prices are a little bit ridiculous. With an eye-watering median of more than $1 million, what chance do young people have of getting into the market at all? Well plenty – if they think laterally as well as realise that Australia is much more than its more populous city. Like many investors, 26-year-old Josh had a family history of property investment. His parents have been investing for a while, with his dad ramping up over recent years with retirement looming. So, Josh thought he knew a bit about property investment – and as it turned out he knew more about that than another popular investment vehicle. “I’ve dabbled in the share market a bit but found it very confusing. I just found that talking to a lot of people that one of the safest investments you can make is property,” he says. But the North Sydney resident knew it was impossible to buy anything in his neck of the woods. He started his journey by trying to find an investment-savvy mortgage broker, which was harder than he expected it to be. “APRA tightened the screws but it wasn’t impossible. It just took longer than I expected. I just wanted to find a mortgage broker that had that investment experience,” he says. Josh finally found what he was looking for but realised his borrowing power wasn’t great – even though he’d saved a deposit. His mum then offered to go guarantor, which meant he could borrow about $400,000. With his finance sorted, and knowing that Sydney wasn’t on the table, Josh started another search. Thankfully his dad’s girlfriend was a client of Propertyology’s and raved about the strong performance of the property the firm had helped her buy. Josh says he also understood the value of paying for expertise. “Speaking to my father and a few people as well, the way buyer’s agents work, you’re paying for their experience because I’m not that experienced in property investing at all,” he says. Josh started chatting to Bryan and Euan at Propertyology and soon realised that he had a lot of holes in his property investment knowledge. “I didn’t really have any idea how buying a property would work. I’d got the finance but I didn’t realise that there were so many more steps that you had to take,” he says. With a budget of $400,000, Josh knew that most capital cities were out but there were plenty of other locations that would work – as long as he thought laterally. When the firm made their location recommendation, Josh admits he was a little surprised, but the strength of Propertyology’s research soon had him confident that it was the right choice. In September 2017, Josh bought his first property with the help of the firm. 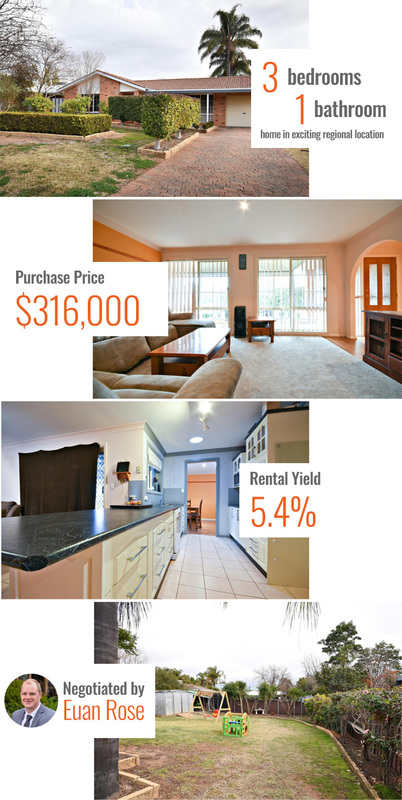 It’s a three-bedroom house in a major New South Wales regional location that Euan negotiated down to $320,000. It also pulls in $330 per week. The property settled just after Josh’s 26th birthday. “I didn’t realise how many things that you had to line up and think about,” he says. “It’s that peace of mind that they’ve sorted out everything. It feels like they’re holding your hand the whole way through so you’re not going to get a nasty fright. “Another reason I went with them is because they’re multi-award winning as well. They’re the best in the business. There’s no questions there and the way they operate is so professional. With the first property in his portfolio, Josh is hoping to expand it next year. Over time, he hopes to be in the same position as many other successful investors who can choose to work if they want to and who aren’t “slaves to the money”. In the meantime, he’ll stay renting in North Sydney and working as an executive producer of a radio show, while investing in more affordable locations elsewhere. “I’m happy with (rentvesting). Even though you’re living in a property and you can’t nail a painting to a wall, it’s a better option that being burdened by a $1 million debt that’s not really doing too much,” he says. Here’s some general information about Propertyology’s services and how they can help you to take control of your financial future. This article and many others can be found on The Real Estate Conversation. Helping Our Clients Invest In An Exciting New Location! What’s Our Reward? Knowing We Are Doing Our Best By Our Clients.